Oconee County residents who want to review and offer comments on planned roadway projects in the county that are slated to receive state and federal funding in the next five years–including the proposed widening of Simonton Bridge road–will have a chance on Oct. 13. Madison Athens-Clarke Oconee Regional Transportation Study (MACORTS) has scheduled a public meeting for 5 to 7 p.m. on that date at the Community Center in Oconee Veterans Park, 3500 Hog Mountain Road. While much of the media attention to the MACORTS proposal has been focused on the Simonton Bridge road widening to four lanes, the five-year plan also includes funding for a controversial flyover of SR Loop 10 from Daniells Bridge road to what is now called Jennings Mill parkway at Home Depot. 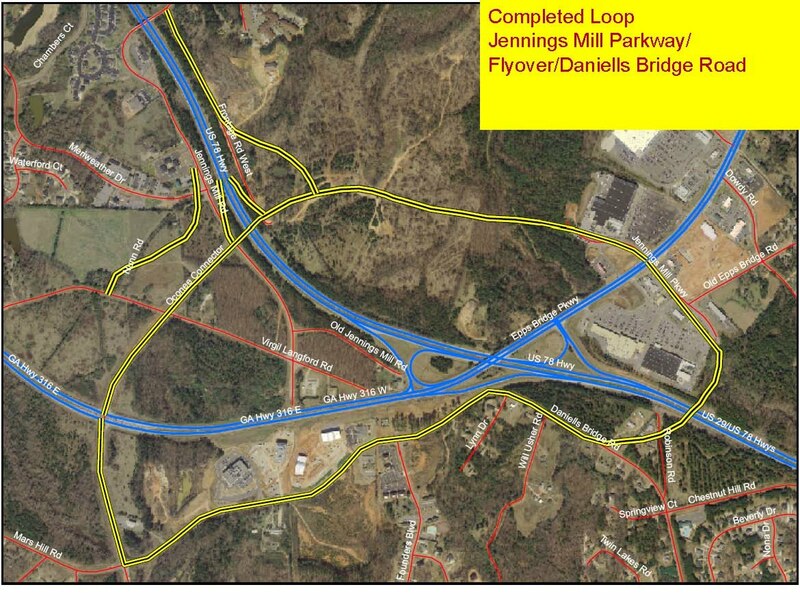 That flyover would be part of a loop the county wants to create, incorporating the Oconee Connector Extension now under construction and part of the current Daniells Bridge road. The goal is to stimulate further commercial development of land along the new roadway. The MACORTS plan also includes the widening of Mars Hill road to four lanes from SR 316 to Watkinsville. These projects–Simonton Bridge road widening, the Daniells Bridge Road Extension, and the Mars Hill road widening–are the three that county representatives to MACORTS have designated as the top priority for state and federal road funding in the urbanized northern part of the county. MACORTS is the metropolitan planning organization for southern Madison County, Athens-Clarke County, and northern Oconee County. The document to be reviewed and commented upon at the Oct. 13 meeting is called the Fiscal Years 2010-2013 Transportation Improvement Program and the Fiscal Years 2014-2015 Second Tier of Projects. This documents is required by the federal government and the Georgia Department of Transportation for federal and state roadway funding. The current document was approved by the MACORTS Policy Committee at its meeting on Sept. 9. Representing the county at the meeting were Board of Commissioners Chairman Melvin Davis and Frank Watson, a citizen member from Oconee County, according to Sherry Moore, a transportation planner with Athens-Clarke County. Moore, designated as the contact person by MACORTS, told me yesterday that the official minutes of the meeting have not yet been released to the public. Davis and Watson are the two Oconee County voting members of the MACORTS Policy Committee. According to Moore, Wayne Provost, director of Strategic and Land Range Planning for Oconee County, also attended. Provost is a nonvoting member of the Policy Committee. Moore said Watkinsville Mayor Jim Luken also was at the meeting. The Watkinsville Council voted unanimously on Aug. 12 to oppose the widening of Simonton Bridge road. The first priority for Oconee County funding listed in the MACORTS document is the first phase of the Mars Hill road widening from SR316 to Hog Mountain road. The county is seeking $12.3 million in right of way funds for the project, which ultimately is expected to cost $53 million. Earlier this year the state authorized the county to begin right of way acquisition for the project and promised to reimburse the county $9.8 million for property purchased. The county is not seeking any money for the second or third phase of the Mars Hill road project in the MACORTS document, though their inclusion is a statement of county priorities. Phase two would widen Experiment Station road from Hog Mountain road in Butler’s Crossing to US 441. The third phase would continue the widening to SR 15 in Watkinsville. Mars Hill road turns into Experiment Station road at Butler’s Crossing. The estimated cost of phase two of the project is $9 million, while the estimated cost of phase three is $4.5 million. The widening of Simonton Bridge road from downtown Watkinsville to the Clarke County line, a distance of 2.5 miles, is estimated to cost $4 million, but no money is sought through fiscal year 2015. Construction is labeled in the MACORTS document as "long-range." The Daniells Bridge Road Extension is 0.7 miles in length and expected to cost $4.1 million. The county is seeking $50,000 in preliminary engineering funding for fiscal year 2015 and to begin construction in fiscal year 2017. In December of 2008 the county promised that it would widen Daniells Bridge road from the Oconee Connector to just east of the blind curve when it approved a rezone for a commercial property at the curve. Though it said at the time the work would be completed this past summer, it has not done any work on the roadway. Residents opposed that rezone, saying it would bring additional commercial traffic into what is now a residential neighborhood. Following the MACORTS meeting on Oct. 13, the county’s Citizen Advisory Committee on Land Use and Transportation Planning will meet in the same room to discuss plans for a new county courthouse. County Administrator Alan Theriault is scheduled to address the citizen committee on needs of the administrative offices of the county for additional space. Watson, who is the citizen representative to the MACORTS Policy Committee, is a member of the Land Use and Transportation committee. Persons who cannot attend the meeting on Oct. 13 but wish to make comment on the plan can do so at the MACORTS web site.